Jamaica offers a quick fix for the winter blues. 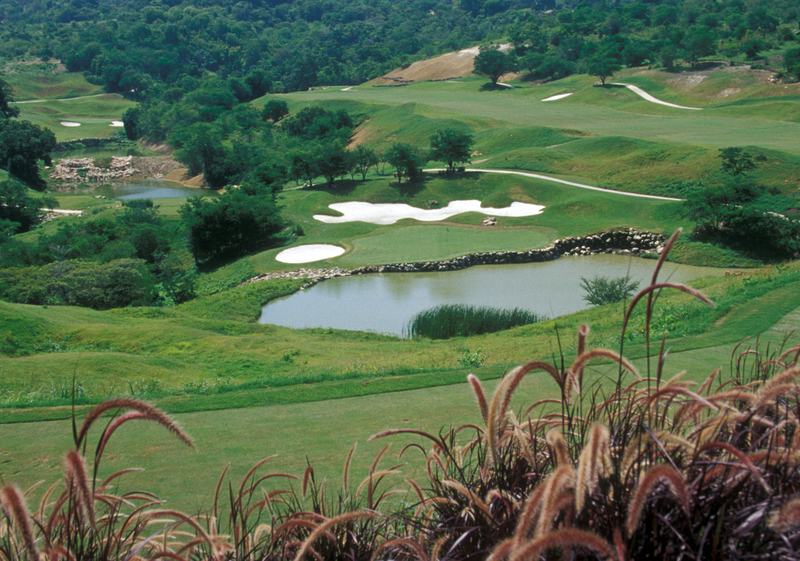 Montego Bay is easy to get to and offers enough good golf to keep you busy for a week or more, starting with the White Witch Golf Course at Rose Hall. 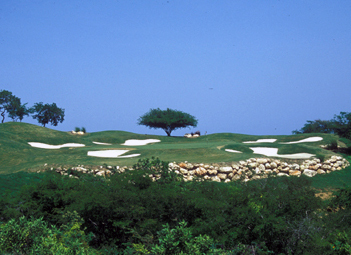 Opened in 2000, the course is named for one of Jamaica’s most famous legends, “the White Witch of Rose Hall.” The beautiful mistress of the 4,000-acre Rose Hall sugar plantation, Annee Palmer practiced voodoo, abused her slaves and murdered three successive husbands and several lovers. Locals are quick to say that Annee still haunts the Rose Hall Great House and the grounds of the estate now occupied by the Ritz and the neighboring Wyndham Rose Hall Resort. And maybe she does. I certainly blamed her for several wayward putts when I played her namesake golf course. The design is by Robert von Hagge and Rick Baril, who also did a complete redesign of an old track now called Cinnamon Hill. The addition of these two courses makes Montego Bay an enticing golf destination with four outstanding layouts and a handful of lesser courses that are still a lot more fun than shoveling snow back home. Not far from the White Witch is the elegant Half Moon Resort, where Roger Rulewich did a masterful renovation of the Robert Trent Jones Sr. layout. A bit farther west is Tryall Resort and its classic course, a former Johnny Walker venue that is well regarded throughout the Caribbean. 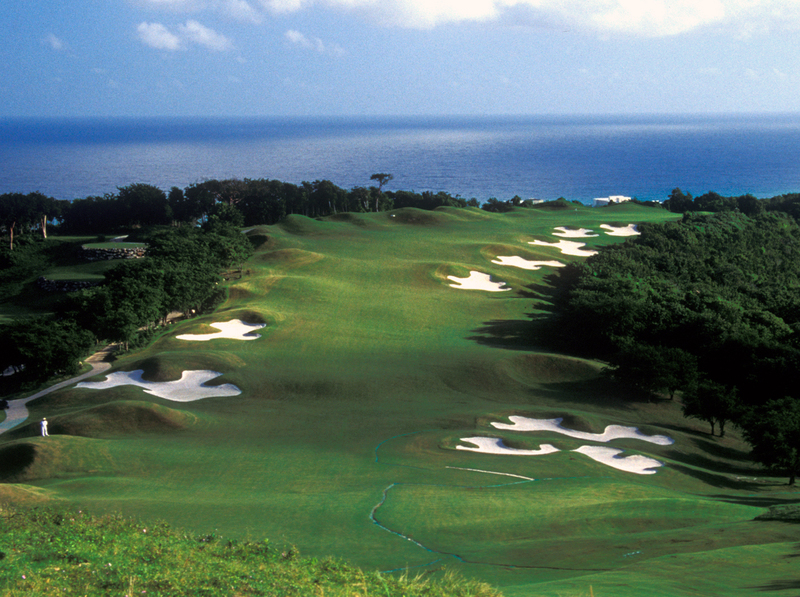 But if the White Witch were the only game in Jamaica, savvy golfers would still make the trip. It’s that good. I expected a traditional tropical layout. Instead, I found myself on mountainous terrain without a palm tree in sight. However, the tradewinds, colorful foliage and spectacular ocean views on 16 holes never let me forget I was in the Caribbean. This 600-acre swath of the Rose Hall estate is rocky, precipitous and wild, but also quite beautiful. The 6,718-yard track follows the high ground where there are cool breezes, and skips across ravines and hollows where the heat could be oppressive. This elevated route also makes the course visually–and often physically–intimidating, with long carries over jungle-like terrain and raised fairways dropping off into dense foliage. Play begins with an eye-opener–a 550-yard par 5 which drops abruptly off the tee to a canted fairway, then climbs steeply past a succession of huge bunkers on the right to a small tabletop green tucked out of sight off to the right. It’s a daunting hole from the tee and very scenic, with the ocean visible in the distance. Another beauty is the par 3 seventeenth hole, 161 yards slightly downhill to a small green surrounded by sand bunkers. Unless the wind throws a tantrum, this is not a hard hole, but it is among the most memorable for its looks–white sand sharply contrasting with rich green turf and the blue backdrop of ocean. A windswept tree silhouetted against the sky provides just the right finishing touch. The golf experience is top drawer, from pewter bag tags inscribed with each player’s name to a well-schooled cadre of white-suited caddies called golf “concierges” to the luxurious changing rooms and elegant dining verandah of the White Witch Clubhouse. Debuting in November 2014 on the grounds of the former Ritz Carlton Rose Hall are the Hyatt Zilara Rose Hall (adults only) and the Hyatt Ziva Rose Hall–co-joined resorts with access to the White Witch. One sultry evening my golf foursome left a lively poolside cocktail party to visit Annee’s place–the Rose Hall Great House–a commanding presence and a Jamaican landmark. The three-story stone mansion, built at inestimable cost in the sugar baron era of the 1770s, was restored by the late industrialist John Rollins and his wife Michele. It draws nearly a million visitors a year–but few of them after dark. Yellow lights glowed in the mansion windows, and even though the heat of the day still radiated from the stone stairway leading up to the wide front door, I felt the hair rise on my bare arms. I noticed that my companions had stopped talking. It was a bewitching night and we were in the right place for a ghost story. Our Jamaican guide obliged us with all of the gory details as we peered into rooms where Annee wined and dined, courted, bedded and dispatched her husbands and various lovers. A portrait of the mistress with unidentified children (she had none of her own) seemed innocent enough until our guide pointed out that the lady’s eyes followed us around the room. In the wine cellar we examined a gallery of photos taken by visitors that showed blurry images of a white-robed figure at the mansion windows, or standing behind grinning tourists, or reflected in the mirrors in Annee’s boudoir. On impulse, I left a cup of rum punch in a niche of the massive stone wall—a token for Annee. What could it hurt? Perhaps my putts would roll true the next time I played the White Witch.